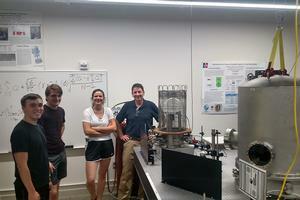 Students Maya Kinley-Hanlon, David Bialy, and Jacob Vancampen with Philip Johnson in AU’s gravitational wave detector lab. Working on space missions to analyze the atmosphere of Mars and look for life on Jupiter’s moon Europa, studying comets and the origin of early organic molecules, and getting involved in community outreach by helping local middle and high schools launch their own miniature ThinSats satellites are just some of the projects underway at American University’s new Institute for Integrated Space Science and Technology (ISSTI). Directed by Associate Professor of Physics Philip Johnson, the Institute was formed within AU’s Department of Physics to facilitate interdisciplinary student, faculty, and staff research in astrophysics, astronomy, astrobiology, heliophysics, planetary science, and space technologies. ISSTI supports nearly 20 externally funded research faculty working on 12 active projects, with total grant funding of more than $7.4 million from NASA, the National Science Foundation, and other sponsors. A key goal of ISSTI is to support and grow AU’s partnerships with other area institutions involved in space science. For example, many of ISSTI’s research scientists have labs and offices at NASA Goddard Space Flight Center. This, in turn, provides opportunities for AU students to get paid internships working on NASA projects both over the summer and during the school year. AU Physics Research Professor Demetrios Poulios has brought many AU students into his labs at Goddard, and sometimes these experiences have even led to full-time jobs working at Goddard after graduation. For example, Matt Mullin (BA environmental science, minor applied physics ’18) worked on the development of a spaceflight mission called Dragonfly to Saturn’s moon Titan, and now works full-time at Goddard as an ISSTI research scientist. Another of ISSTI’s partnerships is with the Goddard Center for Astrobiology (GCA). Johnson is principal investigator on an AU award that funds five full-time ISSTI researchers and staff, as well as an undergraduate summer research program in astrobiology at Goddard. The summer program attracts students from across the US who conduct research to understand the origins of life in our solar system and beyond. Fred Bruhweiler, former director and principal investigator of the Center for Excellence in Physics of the Heliosphere and the Sun at The Catholic University of America, has worked closely with Johnson and also played a major role in the formation of ISSTI. “The Institute is addressing some of the 21st century’s most fundamental scientific and technological questions,” says Bruhweiler. Retired from Catholic University, he joined AU Physics as a research professor in residence so that he could stay active in both research and science education. “His long experience in partnering with NASA and supporting research scientists has been invaluable in building ISSTI at AU,” according to Johnson. Bruhweiler has nearly $2.5 million in grants funded through AU, which support multiple projects and researchers. He has also been working closely with Professorial Lecturer Cyndee Finkel and other AU physics faculty on a partnership with Virginia Space to launch three ThinSats satellites next spring from the Mid-Atlantic Space Port. The three AU ThinSats will be put into orbit as part of the mission to resupply the International Space Station. These satellites are roughly the size of a cell phone and will allow AU undergraduates to conduct original research in space on devices designed and assembled in AU’s new Design and Build Lab, managed by Technology Manager Kristof Aldenderfer. Other ISSTI projects include Physics Research Assistant Professor Boncho Bonev’s research on comets with his partners at Johns Hopkins University Applied Physics Laboratory and the University of Maryland, and co-sponsoring the spring ’18 NASA Goddard symposium, “Environments of Terrestrial Planets Under the Young Sun: Seeds of Biomolecules,” which was organized and run by ISSTI Research Professor of Physics Vladimir Airapetian. Additionally, the Department of Physics is also home for the NASA DC Space Grant Consortium, directed by Physics Professor Nate Harshman. It supports research by a number of AU students and faculty every year. Although ISSTI is already off to a strong start, Johnson held an official ISSTI launch event during the fall 2018 semester to raise awareness of the new Institute among faculty and students. “I hope to get even more students and faculty involved in ISSTI projects in the coming year,” he says.